Tariq Ramadan, 2009. Wikicommons/Joshua Sherurcij. some rights reserved. Zakaria Hamidi is surprised at how many ‘Dutch people’ have come along to the first of a series of public debates in Rotterdam organised by the newly-launched New Horizon – a platform for discussion with a special focus on Islam in the Netherlands. The Mayor of Rotterdam has given a paternalistic blessing to the proceedings, with a few sincerely felt words urging Muslims and non-Muslims alike to take responsibility for their city. After 9/11, the Mayor had responded to the call for improving ‘social cohesion in the cities’ by initiating an annual Day of Dialogue, designed to bring citizens from different cultural backgrounds together around tables set up throughout the city, to discuss concrete challenges faced by their communities as well as Rotterdam as a whole. No subject was taboo: the main idea was the idea of inclusion. After a while, Zakaria and his colleagues had the feeling that it was always the same people who came and talked. State-funded Muslim organisations invited them to participate in discussions of ‘Islam and homosexuality’ or ‘Islam and wife-beating’, but there seemed little space to discuss European identity, the space that secular society gives to religion, or Iraq. Zakaria and his friends decided that they would like to organise their own debates. Over 800 of us are packed in serried rows into the big Aula conference hall in Erasmus University on a Friday night, mid January, waiting for the arrival of what the young lady in the Chair describes as ‘two men who have dedicated a lot of time, energy and heart to analysing the problems of disharmony between Muslims and non-Muslims, beginning with Belgium and France, but always aiming for European solutions – solutions for the world at large.’ It has taken Zakaria a year to bring his speakers together, and 200 people have already had to be turned away. What everybody there knows but she doesn’t mention is that Dyab Abou Jahjah, president of the Arab European League (AEL) with headquarters in Antwerp, founder of the fledgling Muslim Democratic Party in Belgium and promoter of a militant form of Arab European identity, and Tariq Ramadan, Swiss-born professor of philosophy, and author of numerous books including To be a European Muslim and in 2004, Western Muslims & the Future of Islam, are two of the most charismatic and controversial figures to emerge from the Muslim community in Europe, just in time to leap into the post-9/11 spotlight. Both men have a considerable following, and on the surface seem to disagree about almost everything. 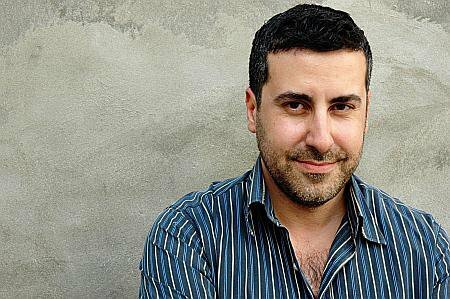 Dyab Abou Jahjah, born in the Lebanon, has been called the Belgian Malcolm X, while Tariq Ramadan, as he will remind us tonight, is often described as ‘the preacher of the banlieues’. Dyab Abou Jahjah, born in the Lebanon, has been called the Belgian Malcolm X, while Tariq Ramadan, as he will remind us tonight, is often described as ‘the preacher of the banlieues’. Abou Jahjah sees his comrades as members of a pan-Arab nation or diaspora who also happen to be European citizens; while Ramadan’s message begins and ends in his Islamic principles. So our Chair’s pious-sounding concluding remark that, ‘Maybe by the end of the night, we will find out that both men would however like to join forces… in helping Muslims to freedom and peace’ does little to dent the hopes of those who came wanting to hear a good row. The speakers have been invited to lay out their wares by addressing brief questions with a right of reply after each, starting with: is being a Muslim compatible with living in Europe – can Islam fit in? Tariq Ramadan is first up with a series of linked arguments which he makes systematically, as you might expect from a philosopher. First thesis: Islam is not a world which you find yourself inside or outside. It is a universal religion based on a set of principles. Therefore, you do not have to decide whether it has to be subsumed within your European culture, or the other way around. The constitutions and legal frameworks of the European countries are based on two essential principles in this regard, freedom of worship, freedom of conscience. No-one is going to tell a Muslim living in Holland, ‘You have to drink alcohol; you cannot fast during Ramadan’. So, he concludes his first point, ‘I can be fully Muslim and fully European.’ His second point comes from within the Islamic tradition. Not only, as Muslims, do you have to respect the legal framework in which you live, but you must do this in the name of Islam – since it is said within that tradition, ‘you must respect the contract.’ A deeper understanding of your religion precisely obliges you to be a deeply committed ‘true and transparent citizen’ in the country in which you live. It is not against Islam or as an exception to the norm practised in majority Islamic countries, that you are a committed European citizen: quite the reverse. Politicians, he continues to enthusiastic applause, must also learn this lesson: the politicians who neglect the community in between elections, and then come offering support for the building of a mosque at the last moment - they are using religion to get votes rather than treating the citizen as he or she deserves; and the other politicians, like the French MP who described the young French rioters to him as ‘those immigrants’, and when pushed, denied that they were ‘genuinely French’. ‘What then is a genuine Frenchman?’ Ramadan had asked him – ‘a white Frenchman?’ He has little time for politicians and analysts who seem determined to centre their analysis around ‘Islam, integration and identity’, let alone those who turn fears of Islam to short-term electoral advantage, when the real issues are those of social and economic deprivation, racism and ghettoisation. While both have been taking pot-shots at each other, neither the British nor the French approach, he says, is adequate to the challenge. While both have been taking pot-shots at each other, neither the British nor the French approach, he says, is adequate to the challenge. Dyab Abou Jahjah now rises to say that he agrees with ‘80% of what he has just heard’, adding amicably that nobody will be surprised if he proceeds to concentrate on the areas in which he disagrees. His main point is a reformulation of the opening question. Since we are indeed all European citizens with critical capacities, ‘Why do people take it forgranted that we should look at the Netherlands, France and Belgium as places where we should just fit in? When we see that they do not live up to their own constitutions, or EU or international conventions on human rights – shouldn’t we be changing them? My question is, is Europe as it stands today, compatible with democracy?’ "My question is, is Europe as it stands today, compatible with democracy?" Dyab Abou Jahjah. 2008. Wikicommons/Hans Soete. Some rights reserved. Once again, there is enthusiastic applause, as Abou Jahjah concludes that what follows from this is that everyone has a choice. Whether you are a Dutch Muslim of Moroccan or Turkish descent, a Swiss philosopher with Egyptian roots, or an Arab from Lebanon living in Antwerp, you have a stark choice between forgetting the forms of oppression and expoitation which brought you or your family to Europe in the first place, or aligning yourself with the oppressed and standing up for their rights as well as your own by espousing a radical democrat programme, like the one that the AEL advocates – a new 20-point vision-statement, addressed to the ‘Arab diaspora and the Arab world’, which Abou Jahjah urges the audience to visit on the AEL website. This is not a question of some kind of nostalgia for your origins, or divided loyalty, it is matter of knowing where you stand on key issues of power in the world. "This is not a question of some kind of nostalgia for your origins, or divided loyalty, it is matter of knowing where you stand on key issues of power in the world." The passionate debate that follows these opening provocations has some interesting twists and turns. Ramadan is completely opposed to Islamic schools where these simply add to your segregation from society: Abou Jahjah sees this as a question of political tactics, and regards the recourse to such schools as understandable where mainstream education is dysfunctional and the state forbids girls to wear the hijab. Moreover he welcomes the fierce Dutch debate on this issue prompted by the call amongst others of Ayaan Hirsi Ali, the outspoken Dutch MP who has renounced Islam and all its works - even though he disagrees with everything she says and personally ‘wishes she would shut up’ – a sentiment which provokes another well-humoured round of applause. Ramadan thinks that Islamic political parties are the very worst way to organise one’s-self: Abou Jahjah has founded such a party. Abou Jahjah, coming from Belgium, where 60% of young, urban ‘Moroccan immigrants’ are unemployed, urges European governments to use affirmative action where relevant qualifications exist, to ensure equal access to the labour market. No, he argued, what he wanted was a real anti-discrimination policy, not another ‘scheme’. He points to the success of a Dutch law which obliged companies to prove that they were active in attracting ethnic minority employees. ‘Moroccan unemployment had doubled to 40% in the last two years, once this legislation was withdrawn’, he said. Ramadan saw this as the thin edge of a very undesirable wedge. For him, the example is the United States, where affirmative action, while it provides jobs for the few, has allowed the many to remain jobless and sidelined with such arguments as, ‘Look at Colin Powell and Condoleeza Rice coming from a minority – you should be grateful.’ No, he argued, what he wanted was a real anti-discrimination policy, not another ‘scheme’. At one point, frustrated with the difficulty of putting clear, blue water between his strategies and those of his co-speaker, Abou Jahjah, who has been building a branch of the AEL in France for a while now, implies that ‘the preacher’s’ response to the French rioters is confined to lecturing them on their ‘responsibilities’. He for one would like to put it on the record that he saluted, not their violence – ‘they are using a form of direct action which is traditionally French and perfectly proportionate to the provocation they have suffered’ – but their resistance. It is a rhetorical gesture and it certainly turns up the heat. 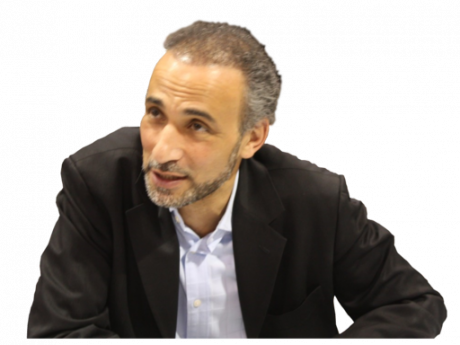 Tariq Ramadan, 2010. Flickr/Srizki. Some rights reserved. Back in the Aula, both men have that uncanny knack of knowing how to needle each other. Ramadan’s accusation of ‘emotionality’ touches a raw nerve in Abou Jahjah, who ‘gets enough of that thrown at him back in Antwerp!’ As far as he is concerned, ‘If his strategy is that nobody should be racist, that everyone should give everyone else a hug and then we’ll go home – isn’t that emotionality?’: those French youngsters have done far better for their cause than they would have done listening to Ramadan on ‘how a good Muslim should behave!’ Ramadan accuses Abou Jahjah of ‘disrespect’, and the audience begins to settle into something like the carnival atmosphere of a Wimbledon final. Some of them have been trying to work out what these differences amount to for themselves. A man at the back pipes up to the effect that it is a question of their respective constituences: Abou Jahjah speaks for ‘angry immigrants who feel socially excluded, while Ramadan’s supporters want to canalise their anger into a more positive channel’. A woman suggests that they look to the civil rights movement of the USA. Here was a similar, dual and complementary approach, for, ‘It was when they got afraid of Malcolm X that they started talking to Martin Luther King. Couldn’t that work for these two strategies?’ Sympathies seem pretty well divided: or perhaps it would be more exact to say that many in the audience do not want to have to choose. Nevertheless in the end, it is the initially more propitiatory Ramadan who best articulates the divide. The main focus of his criticism, which he returns to again and again, is that the AEL’s combative, identity-based politics can only aid and abett European society in treating Muslims as a minority apart. Two years ago, the professor was looking forward to his new, double tenured job for life at the University of Notre Dame. Suddenly in August 2004, his US visa was revoked for ‘national security’ reasons, with no explanation. Encouraged to reapply by Colin Powell in the State Department, he still heard nothing, and finally put an end to what he saw as humiliating uncertainty for himself and his family by resigning from this post in December of that year. We met in London a few days after Professor Ramadan, with the backing of the American Civil Liberties Union, the American Association of University professors, PEN America Center, and the American Academy of Religion, filed a federal lawsuit against the US Government, determined to clear his name. For the last five years, he has been building a think tank, the European Muslim Network, which brings together leaders of their communities, men and women who see themselves as Europeans thinking about a European future that in no way contradicts their Muslim faith, from eighteen countries, including Bosnia, Albania, Kosovo, Bulgaria, Turkey, Holland, ‘And it works very well, They are spreading these ideas of citizenship which we share.’At the same time, he has been talking frankly to government, about the need to encourage a ‘critical belonging’ in their Muslim communities. And now, no doubt due to the Madrid bombing, French riots and July 7 attacks in London, they are listening to him: an invitation onto the Task Force set up in the wake of the latter by the British Government, is only one of numerous invitations he has received. What he says to those governments as he goes around advocating a national movement of independent local initiatives both for Muslims and with others, runs something like this: ‘ You cannot decide for the people who their leaders are. You cannot just send in Muslim scholars and intellectual road-shows to preach to the converted: you need mediators more in touch with the local realities. And the way you deal with them is really important. The old colonial way – ‘take us to your leaders so that we can work out how to deal with you’ - is the wrong way. Mediators have to be working credibly from within trying to help people, and Government too has to be sincere in its agenda. It has to ask itself: “Do we just want people to follow someone who is following us? Or are we willing to facilitate a process towards autonomy?” It is only if they choose the latter that those mediators will have any credibility.’ That is usually the sticking point: because ‘governments like control’. If they make the right choice, there are two golden rules to follow: the first is not to impose the type of discourse Muslims should be engaged in. Rather, facilitate these communities in what they want to do. In some areas there simply needs to be mutual recognition that there is a common interest in spreading a better understanding of who you are and where you live. In others, politicians tend to ‘Islamicise’ problems rather than face up to deep socio-economic challenges. It is very difficult sometimes, since many of the people who experience these problems are under social pressures and are all too ready to essentialise their experience – that is the kind of background they come from. But we need an altogether more deconstructive approach which can distinguish the different challenges here whilst recognising that they are also related in quite specific ways.’ So that is rule number one: trust the Muslims – it is their responsibility to be able to say, ‘Look, this is not a religious problem: this is a social problem’ - and let them do the job independently. But perhaps in concentrating on diaspora rather than citizenship, Ramadan is neglecting some of the AEL’s strengths. In the same two years, whatever the provocation, the AEL has demonstrated a resilient commitment to democracy and citizenship as its bottom line. Two years ago, the organisation survived a challenge from its then strong Islamist wing. This resulted in a new vision statement rejecting any kind of theocratic state, which prompted a walk-out by the Islamist wing. Now Islam remains part of the symbolic and cultural identity of many AEL members, but this in itself has no theological or political repercussions. The AEL clearly declares itself a multi-confessional campaign for democracy, containing Christian Arabs, those who are Jewish or of no faith. It continues its energetic fight against Islamophobia, but this is from a democratic and an anti-racist, but not a theological vantage-point. The same programme developes its definition of democracy in what Abou Jahjah describes as a ‘radical leftwing’ direction, as the ‘prevention of any and every kind of concentration of power’. The AEL has been looking for new allies who share their critique of the conventional nostrums of liberal democracy. Again, this is no mere defensive stance. It is clear that such open-ended discussions have a highly motivating and enlivening impact on the lives of the young men and women who rush around in Abou Jahjah’s company. Take, for example, his insistence that ideological oppression can be as oppressive as material oppression, ‘Look at theocratic authoritarianism in Islam, where an exclusive group takes to itself the power to issue fatwas over and above society. This concentration of knowledge is as antipathetic to a healthy democracy as any concentration of capital.’ At the very least, it is an interesting reformulation of people power. Moroever, the sheer cheek and political humour of Abou Jahjah’s stance is hard to reconcile with any ‘victim mentality’. Placed in the context of the highly charged stand-off between the minority immigrant population and the majority in Antwerp, let alone the far right – Abou Jahjah’s fondness for bringing issues out in the open and ‘challenging the boundaries of society’, his talent for media moments and soundbites, and his pride in his movement, have a bravura all their own. 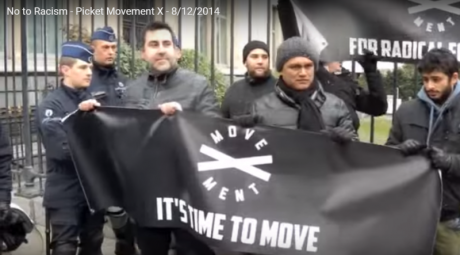 Dyab Abou Jahjah and race equality organisation, Movement X, November 2014. Youtube. This is one reason for his commitment to ‘absolute freedom of speech’. The far right, he believes, have been protected from themselves by laws banning hate speech, ‘Of course, I don’t believe people should call for violence or defame others: there are normal legal frameworks for all that. But when it comes to political opinions and artistic or literary expressions, I don’t believe they should be silenced. Especially in the arts, you really need to be able to give expression to extreme views that challenge what is acceptable.’ He has been honing a version of Voltaire’s dictum for Ayaan Hirsi Ali, ‘I may not like what you say, and might rather that you shut up! – but I will fight for your right to say it’. But what chance is there of such a mobilisation? The local context has its inevitably narrowing effect. The AEL collaborated with a far left party in the last elections in Belgium and will probably do so again this year, despite the fact that many of the latter’s regular voters balked at standing on the same ticket as Muslims and Arabs. This week, we have glimpsed just how rapidly options can narrow worldwide, when a handful of European media men decided to tweak Muslim ‘victim mentality’ by the tail. Check the AEL website today, and you will find its ‘free speech’ channelled into a return series of offensive cartoons. The satire is unerringly directed at the strange negation at the heart of the justification given, for example, by the editor of Die Welt when he claimed on behalf of Europe that ‘It is at the core of our culture that the most sacred things can be subject to criticism, laughter and satire.’ It reads, ‘After the lectures that Arabs and Muslims have received from Europeans on freedom of speech and on tolerance, and after many European newspapers republished the Danish cartoons… the AEL has decided to enter the cartoon business and to use our right of artistic expression. Just like the newspapers in Europe claim that they only want to defend freedom of speech and do not desire to stigmatise Muslims, we also stress that our cartoons are not meant as an offence to anybody and ought not to be taken as a statement against any group, community or historical fact. But if the time has come to break down all taboos, we certainly don’t want to be left behind.’ But in the end, this is not much more than an ultimately dead-end provocation. Muslim fundamentalist infiltration can be a problem and is a problem in Europe today. But the scale of that phenomenon is as yet very marginal. This is not reality today. Not yet. So we come full circle to a persistent sense of just how much, albeit in very different ways, these two men have in common. Despite the theatricals and the sparring, both speakers want to see an end to Muslim ‘victim mentality’; both are urging people instead to be active in solving their own problems; both urge and promote active citizenship – not crude notions of nationality or mechanistic ideas of ‘integration’ - in countries where there is increasing disillusionment with electoral politics, particularly amongst young people; and both agree that being loyal to your country as a citizen entails being critical when that country is wrong. This may be part of the answer to Zakaria’s question about his first debate: why were so many ‘Dutch people’ there? I can only guess. 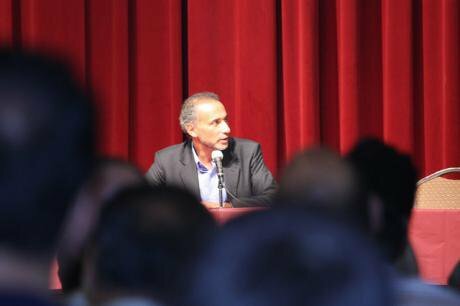 But speaking as a member of a weary electorate in Britain, where the political class is gearing itself up to offer ‘new localism’ as a cautious concession to political renewal, this was one of those rare evenings, thanks to Tariq Ramadan and Dyab Abou Jahjah, when politics suddenly seemed to matter a lot, to us all.